Screenshot of Cambridge City Council’s upgraded online planning web pages. Cambridge City Council has just launched a new online planning system. Plans, drawings and documentation for planning applications can now be viewed on the council’s public website. Previously viewing plans almost always required visiting the Guildhall in-person. The City Council is going to be able to close its planning reception as a result of launching the extended online service. Presumably objections and letters of support are also to be made available online, though this has not started to happen yet. Only residents associations and not the wider public were consulted in relation to the expanded online service. The council is not setting the planning information free. It has gone to extreme lengths to try and keep control of the data and is currently forbidding others from representing the data and producing things like lists, or maps, of new planning applications. A a briefing on the new “public access” planning system is being taken around each of Cambridge City Council’s Area committees in the next few weeks. Under the old system those wishing to look at the details of a planning application and comments which had been made on it had to go into the Guildhall and ask to see the file. This was a physical real file filled with an assortment of papers, including print outs of plans, print outs of emails and the odd handwritten or even typewritten letter. The idea of the new system appears to be that it will allow access to documents online, enabling the council stop operating a planning reception where people can go and view the files in person. Individuals will also to be able to register an account and obtain email alerts about new planning applications – previously this service was only offered to councillors, residents associations and others with a special relationship with the council. I think what the council is now doing amounts to a fantastic step forward. I have noticed many councillors, particularly at area committees making planning decisions obviously without having been into the council offices to review the all the relevant documents. Hopefully that problem will be vastly reduced in the future as access to applications and representations will be so much easier. If this increased online publication does turn out to be the step change which it appears it could be councillors who don’t regularly visit the council offices will now have the opportunity to better informed about the applications in-front of them and be better aware of the detail of what objectors and supporters of a particular application have been saying. While I have on a number of occasions been in to the city council to view planning applications it is very time consuming; placing the application files online will make commenting on planning applications much more accessible and may well result in engaging a much broader group of people and enabling more people to have their say in the process. Council officers Nova Roberts, the Head of Customer Service, and Paul Boucher, Business & Information Services Manager in the Environment and Planning department, are looking: to receive feedback and comments at the area committee briefing sessions. It will be up to area committee chairs as to if those comments can come from the public or just from councillors and it is unclear what, if any, prospect there is for the council’s contractor Idox Group to act on any suggestions made at this late stage (after the launch of the new system). Prior to the launch the council only talked to residents associations, and not to the wider public, about the new system. I suspect this decision to exclude the majority of those with an interest in the city from having input into the specification as meant the council has not benefited as much as it could have done from the vast pool of knowledge and talent available in Cambridge. Consulting with a wider group would also I believe have prompted the council to think twice about its decision to adopt such a restrictive approach to allowing re-use, linking, and re-presentation of the information. The old system appeared to have the functionality to enable the uploading of files but it generally wasn’t used. Officers have started uploading documents into the new upgraded system, however I have not yet seen any comments (objections or letters of support) published. Currently, as was the case with the old system, the number of comments is noted, but the content is not available. Until the comments are online then continuing easy public access to the raw paper files containing them is absolutely essential. One major problem with the council’s approach is that they’ve not sought to set the information they’re holding free. The council don’t appear keen on others doing anything with what they see as “their” planning application data. The council’s terms and conditions strictly forbid people from re-presenting the information in the system; so it appears that for example residents associations will have to risk legal action from the council if they republish notices of local planning applications on their own websites, things like my map of tree works may be under threat too. They’ve not even made it possible for people to include straightforward links to applications or documents. I hit this problem earlier today when I decided to tweet a link to a plan showing the view from Jesus Green of a (now withdrawn) proposed extension to the Christ’s College Boathouse only to be rapidly told by many others that they could not access the document. I then had to direct them to the I agree button to submit to the city council’s extensive terms and conditions so that they would be able to view the drawings of what had been proposed. Cambridge City Council currently bans cameras from its planning reception; that attitude has persisted as it moves online. 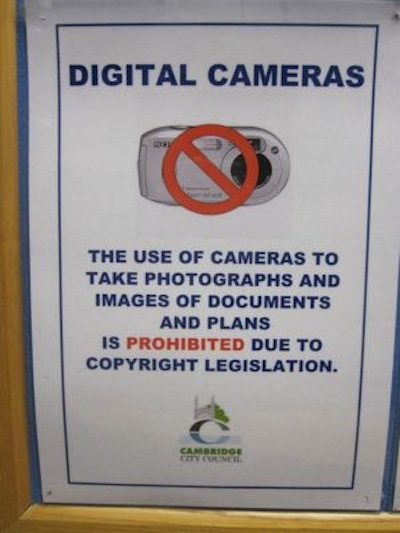 The council’s planning offices have posters on the walls forbidding the use of digital cameras to take copies of plans (though official copies could be purchased so the motivation is unclear). This results in ludicrous situations such as campaigners copying plans out by hand. I have previously published photos of plans on my website when discussing planning applications and such images have also appeared in the local media as their use can clearly be justified on journalistic grounds. I think that details of planning applications are public information and they ought be as accessible as possible for those wishing to debate and comment on them. The loss of older historical data with the move to the upgraded system has been raised with me as a matter of concern; the previous system had very valuable data from decades ago – already clearly digitised and available online – but apparently dumped during the import into this new system. To cease to make this material available is the modern equivalent of tossing the city’s civic records on a bonfire. I would like to know if the new public access system is reliable and comprehensive enough to allow people to conduct their own searches as are required for mortgages or if the council intends to keep charging people for professional searches. 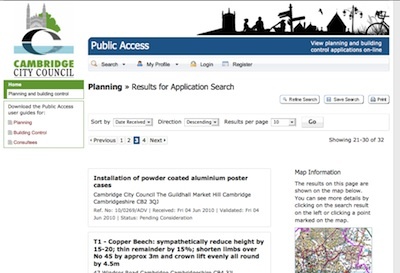 The previous system carried a disclaimer stating it was: “not a substitute for carrying out a formal land search or other legal enquiries”, but surely as technology improves there it will be less acceptable for councils to charge for access to information which ought be easily accessible on the web and Cambridge City Council ought be leading the way. In this, as with other areas where I’m trying to get Cambridge City Council to operate in a more open and transparent manner, I am not just campaigning but have taken some direct action. I have published a live copy of the list of the current month’s planning applications on my website. Links from my page by-pass the City Council’s I agree button meaning they’re of use to everyone not just those who’ve visited the city council’s planning pages earlier during the same browsing session. I have also made the monthly application list available as an RSS Feed. The council had not even specified an RSS feed of new applications for their new system, never mind a geoRSS feed which would be better. Ideally of course such feeds would be available for any of the existing advanced search options as well as for other critera such as “near my home”. Currently incorporation into Planning Alerts is less useful than it would be if the council showed something other than an error message to those following links to pages and documents within the new planning system. Unless those following the links have recently clicked on the council’s “I agree” button they would see the error and not be offered any easy route to finding the intended documents. Planningalerts.com frees up the data and makes it much easier for both individuals and website operators to reuse it. A lot of nonsense bureaucracy has been newly exposed and can rapidly be seen by those browsing through the new system. For example an application from another part of the council to the planning department for new noticeboards on the Guildhall prompted one council officer to write back to another requesting they pay a fee (suggesting a cheque from Cambridge City Council to Cambridge City Council) and requesting plans to a particular specification be provided. Public Access Module £12,000 Cost of software upgrade from Idox? Server Replacements £48,000 Further spending is planned on servers. I hope those who already charge crazy amounts for creating central government websites don’t hear of this as they might start adding tens of thousands onto their bills for equipment for the public to view their websites on too! I think it is scandalous private contractors sell these systems repeatedly to different parts of the public sector across the country. Where there is clear potential for software to be reused within the public sector it we ought pay for it once and require it be released under an open source licence. When councils find ways of improving it the upgrades should be freely distributed and made available for use by all councils. No doubt there are other costs which have appeared in other year’s accounts and some of the costs mentioned above, such as the servers, may not be entirely related to the expanded online service. Will records of actions taken by chairs of committees making planning decisions (and agreement of opposition spokespeople), which are currently kept in planning files be uploaded to the new system? How quickly will documents be uploaded onto the system? Will all representations be uploaded on the day they are received? Will details of S.106 agreements be posted on the system? Will this be correlated with details of how the funds raised have been spent? Will the agendas of meetings considering planning items link to the detailed information. ie. Do the “ModernGov” and “PublicAccess” systems interact effectively and automatically? Why, when a user meets a “Document Unavailable” error due to not having accepted the councils terms and conditions eg. after following an external link to a specific application or document are they not offered the opportunity to click the “I agree” button at that point? What is the plan relating to the inclusion of more historical data? 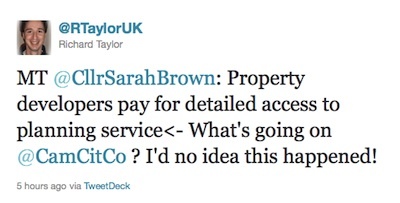 What is currently preventing formal legal land searches being offered free of charge over the web? How many people does the council anticipate will visit the council’s offices to view the planning section of the council’s website? This entry was posted on June 15, 2010 by Richard Taylor. There are a few aspects of the City Council’s new online public access planning which I think it would be worth you querying at the upcoming Environment Scrutiny Committee (to which the actual amounts of money spent on the system are being reported). 1. One cannot link to applications or documents. If you send the link to someone else and they click on it they’ll get an error message as they won’t have arrived via the front page and clicked on the “I agree” button. This is a loss of functionality when compared with the previous system. 2. The council is being very restrictive about what it allows others to do with the planning data. Why not allow say a residents association to produce a Google map containing current applications in its area of interest? Whereas I think the council should be making it easy to do things like this; the new terms and conditions technically prohibit it and the new system doesn’t make the data required to do it as easily accessible as it could and in my view ought. As the briefing offered to councillors and the public at the North Area committee last week requested feedback and comments I am copying Mr Boucher one of the council officers named on the briefing document. Hopefully the fact they are calling for feedback indicates that its not too late to take action on the points I am raising. Overall it is a fantastic step towards openness and transparency; my comments are being made in the hope that a few tweaks could massively improve the system’s usefulness. It seems that the old system had planning apps going back to 1963. Currently the new system lists those apps but only ones after 1984 actually have information associated with them (e.g. applicant name, agent name, etc.) But apparently the older ones are also supposed to be migrated across, and the old system will remain until they do. I have also sent a tweet directed at Cllr Adam Pogonowski who is also a member of the Environment Scrutiny Committee drawing his attention to this article. I completely agree with you regarding copying and accessing plans. However, I don’t think you can blame the City Council for this. It is Ordnance Survey’s massively restrictive terms that require the City to ban copying of plans. They may have gone over the top in not allowing direct links to these, but given the OS’s litigious and draconian approach, I’m not suprised if they are somewhat paranoid about it. The vast majority of the information on the system is not related to OS maps. The key data which is OS related is the “red line” round each site. In order to properly debate and discuss planning applications then I think that there ought be general permission to re-use that in the context of the planning application. Such use is probably permitted under the “fair dealing” provisions in S.30 of the Copyright, Designs and Patents Act 1988. In my view the way to deal with any copyright problem is simply to alert people where material is subject to copyright restrictions; however perhaps the council has a contract with Ordnance Survey which compels them to have the “I agree” button. Data like the latitude and longitude of a site could certainly be made available by the council, as there is no copyright consideration there; but again they might have scandalously and misguidedly signed a contract with their software provider Idox group restricting who can re-use and re-present the data. This online system, which is common across councils, has been problematic for years. It is a virtual monopoly and there is little incentive to improve it. Unfortunately, the only sort of structural requirement to procuring a workable system is ‘accessibility’, which means meeting requirements for people with disabilities. There is no such standard for producing something usable for everybody else, and this is the case across all such systems procured for local government. It is great to have people making suggestions on improvements after the fact but it would be far better if systems were properly tested with likely users from the beginning of the design process – they are not. Though this system is a massive step forward, there are still some really obvious flaws, e.g. the URL not being a permalink after doing a search. These are the sort of thing which a competent web developer ought to be able to fix, quite safely, with little work. Shame on Idox. Perhaps what is needed for a public interest -orientated organisation such as MySociety to backwards-engineer the system to read the same database structure, but with a much better interface on top. At the time of writing the page at that link is accessible even for those who have not clicked the council’s “I agree” button. This is much better than the previous state of affairs and if the “I agree” button isn’t deemed necessary for those accessing documents via an external link it raises the question of why it is needed for those approaching the system from its front page. There is clear, irrational, inconsistency here. I just tried to view the documents associated with an application from Trinity College for installation of a sound reinforcement system to cover the main chapel and the ante-chapel. But for each document I get a “Document Unavailable” error. I am able to view documents on other applications though. On the 17th of June 2010 the new online planning system was presented to the East Area Committee. Three city council officers attended the meeting specifically for the item. Paul Boucher, Business & Information Services Manager along with a technical officer and another member of staff to give a presentation. A slideshow of screenshots of the system was shown to councillors; Cllr Wright was sitting next to be during this and she complained that she couldn’t read any of the text on the screen; neither I suspect could anyone else. After the presentation members of the public were invited to question the officers. Martin Lucas-Smith stepped up and introduced himself as a web-designer and open data campaigner. He started by drawing attention to the restrictive terms and conditions which users of the new system were asked to accept. He noted that re-presentation of the data was being forbidden by the council and argued this was an inappropriate approach. He suggested that others’ ought, for example, if they wished, be able to place planning applications on a Google Map on their website and told the committee doing that kind of thing was quite normal now. The council officers responded. They noted that the legal terms and conditions were very lengthy and reported they had been “approved at some level by the legal team”. They also claimed that releasing location data would require the permission of the Ordnance Survey, and said that things like ward boundaries were the property of the OS. Martin Lucas-Smith followed up to note the recent release of OS data had in-fact resulted in boundary data now being openly available; he also stressed that he hadn’t even been asking about that – just about point locations of planning applications which the OS couldn’t have a claim over. As he was speaking Mr Lucas-Smith took the opportunity to ask if S.106 agreements would be added to the documents section of each application. The officers said that with respect to the s106 agreements they didn’t know, but would take the question back to council and find out. At this point the chair of the East Area Committee requested that the officer’s response to that question, and others not fully addressed, ought be reported back to the East Area Committee in writing. Q: You’ve come here to councillors and the public at area committees, after having built and launched the system. What are you in a position to do as a result of comments you are receiving? Are aspects such as the terms and conditions not fixed by the council’s contract with IDOX? Can you get the problems being highlighted fixed? The officer response was: “We have a little leverage to make changes, for example to the look and feel”. Q: I have found that I have been unable to link to applications and documents. If I try to then I get an error message; I suspect this has been as a result of not approaching the system via the front page and clicking the: “I agree” button on the way in. Many individuals, and residents associations or other groups might want to send links by email, or place them on their websites surely the system ought allow this? Officers responded to say you can link directly to an application; but not to a document. They suggested that the system first generated a “false link” and said something about redirects which they suggested might have been causing the problem I experienced. Q: The line in the accounts for new monitors associated with the new online planning system is for £33,000. You have just told the committee that there are only two new monitors in the customer service centre; did these cost £16,500 each? The officers responded to explain the £33,000 sum was for new monitors throughout the environment and planning offices and the sum covers about 60 new monitors in total. Q: Will all consultation responses be placed on the system “Live”? I can see some which are currently listed but marked not available. Officers told the committee that responses made via the system itsself will be published instantly. Those written to, or emailed to the council will be scanned and placed on the system “all within a couple of days”. Another member of the public then asked what the new system would do to make more people aware of planning applications. He said that currently people had to rely on seeing notices on buildings and lampposts to find out what was under consideration. Officers responded to say the new system allowed people to search by all sorts of different criteria eg. wards, or road names; but there wasn’t any facility for the system to proactively alert people to new applications. Cllr Adam Pogonowski incredulously asked if the officer who said the council was now scanning emails which people had sent to it had really meant what he said. The officer clarified his comments and explained that emails were not printed off and scanned back in, but they did go through a digital process akin to scanning in order to get from the council’s email system to the council’s document management system. The officers noted that this had another effect in that emailed comments didn’t appear under the “comments” but as document attached to the application. Cllr Pogonowski asked if the documents tab could be renamed in light of that, to indicate there were more comments under that tab too, which prompted sharp intakes of breath from the officers and they then told the committee that things like changing bits of text in the user interface were just the kinds of comments they were looking for and thought they were in a position to get IDOX to act on. They did defend the use of the “documents” title though, and claimed there was help text on the system which negated the problem. (It would be interesting to know if the digital copy of the text, ie. a copy and paste-able version of the text, is retained when an email is “scanned” into the council’s document management system). Cllr Wright asked if the old “planning portal” system would continue to run in parallel. She was told it would, as it had other components such as the ability to allow people to make applications online. Cllr Wright explained how she had used it to look up applications. it appeared perhaps the officers talking were about – http://www.planningportal.gov.uk/ but Cllr Wright was talking about the council’s existing planning public access service. Mr Boucher revealed while formally taking questions in-front of the committee that he had read my article and when stepping down from the committee table he promised a response to all the points I have raised. I, Martin Lucas-Smith, and various councillors prefaced their remarks by saying what a fantastic step forward in this new system was; a number of councillors spoke only to express their approval of the new system. On the 24th of June 2010 the new online planning system was presented to the West Central Area Committee. As with the East, three city council officers attended the meeting specifically for the item (If they’re getting overtime this could be getting expensive!). The officers were Paul Boucher, Business & Information Services Manager in the Environment and Planning department along with the operations manager of the “council’s customer service centre” and a technical officer who gave a slide presentation on the system. Additional points made this time included the fact that information on appeals would be included in the system and that the types of personal information to be redacted were email addresses, phone numbers and signatures. Names and addresses of commenters would be required, and would be published. Will this new system email those who use it to make comments on planning applications alerting them to the date of any planning meeting which is to consider the application; will such alerts be sent in time to allow commenters to register to speak? Or will you be continuing with the current system of sending physical letters out to those who email in comments (or who use the online system) which are sent out second class and in my experience don’t always get out in time? Mr Boucher responded to say that the new system does not, and will not have that capability. Member of the public James Woodburn said that his wife had tried to use the system only to be met by lots of blank pages. He said council officers had suggested this might be because he didn’t have sufficiently up to date software on his computer but he said he was sure that wasn’t the right explanation. While replying at the meeting the officers suggested that there might be problems with very large PDF files. Mr Woodburn also stressed that the utility of the new system depended on how quickly new information was added to it, and said there were comments he was aware of (he gave examples) which had not been placed online a number of weeks after they had been submitted. The officers explained scanning and redaction was taking time, longer than simply putting a representation in a file, and admitted there were currently problems and the council’s processes needed to improve. Cllr Rosenstiel said he had tried to use the system but complained he found himself being taken back to the “I agree” page all the time, especially when he tried to re-visit a document which he had already looked at (and presumably kept a link to). He asked why the system appeared unable to remember that he had accepted the terms and conditions, and said: “why can’t it use a cookie”. Cllr Dixon sharply dismissed Cllr Rosenstiel on the bizarre grounds that had not been his experience. Cllr Kightley who was chairing the meeting also dismissed Cllr Rosenstiel’s comments describing them as “technical issues which would soon be ironed out and not something to go into here”. I think the question of when, if at all, users need to be presented with the “I agree” button is a key one which needs to be addressed and would have liked to have heard officers respond to Cllr Rosenstiel. On the documents page for an application from Pembroke College to work on weatherproofing an archway which I think is above is its vehicle entrance opposite Free School Lane, email correspondence has been placed online as .eml files. These can be opened in an email client. Pros: all the information is available. Cons: might be difficult for those who don’t use email applications on their computers (those who only use web-mail) to open; contradicts the council’s declared policy on redacting email addresses. It will be interesting to see if emailed in consultee comments appear in this format or not. I have been looking at the planning applications due to be decided at this evening’s North Area committee. The reports to that committee make no reference to the new online system; they still direct those reading them to the full case files held by the council if they want to see the full plans and read objections and comments in their entirety despite this no-longer being possible. There is no pointer to the existence and functionality of the new online system. 1. There is evidence that emails really are being printed out, having hand written stickers stuck to them, and scanned, by the city council. 2. The redaction is ludicrous. Physical addresses of objectors have been removed. This is despite the area committees being told only email addresses, phone numbers and signatures, would be redacted. Clearly it is important to know where an individual making an objection lives. What’s even sillier is the geographical addresses redacted from the content of the objections are given in the document descriptions. Haha, that’s amusing. Something to bring up at the next East Area (re. scanning in). By the way, Richard, you report that I “incredulously asked….”, but do you not mean that I “asked….. with incredulity”? or did you think my question was incredulous?! “asked with incredulity” is what I meant! Do you remember who the officer was that gave me the “we don’t print off then scan, but just scan in” answer? I really cannot remember who it was! Should planning application notices still be put in public areas close to the properties where a planning application or change of use is being sought? 11 Hertford Street , has an application pending to change this property into a student hostel to the distress of local residents.No public notices have appeared.It will affect a large number of residents both in front, back and either side of the property but very few people have been informed.The application is from Monpelier Penson Trust (based in Manchester). Number 11 is just a couple of doors away from other houses which are used as hostel style student accommodation by Magdalene College. The new minister for Minister for Housing and Local Government has made clear his intent to remove the need for planning permission when small “family houses” as he calls them become shared houses. I agree with that stance. My view is that house sharers ought have access to all rental properties on the market and should not be discriminated against. If a house is to become institutional accommodation eg. rooms are to be rented individually on separate tenancy/licence agreements by an educational establishment then seeking planning permission ought be required. Looking into this – and looking at what’s on the public access planning system near-by properties – showed me another completely ludicrous use of the new system. Instead of linking to planning committee reports – which are available elsewhere on the council site- on one application the planning report has been scanned in and added to the planning public access system. The planning permission is sought for 11 St Luke’s Street, I live in Hertford Street, Cambridge very close St Lukes Street. Building work has started even though planning permission has not been granted yet. At the North Area Committee on the 15th of July I used the open forum section of the meeting to ask councillors to do more to point to and encourage use the fantastic new online system. I noted the planning reports to the meeting still prompted those reading them to visit the council to view the full case files. I also noted there had been excessive and nonsensical redaction. I gave an example of neighbour comments on an application the committee had considered earlier where the neighbour’s address had been removed from the content of his letter despite it being described publicly as a letter from a resident of 8D Corona Road. I noted that such redaction was greater than the announced policy of removing only signatures, email addresses and phone numbers. I also suggested it would be useful, and in some cases essential to interpret comments to know the address of the correspondent. I also drew councillors to the absurdity of the situation they are presiding over whereby they are getting their officers to print out emails, stick stickers on them, write on them, and scan them back in (in doing so losing the digital copy of the text). Cllr Boyce led the response from councillors. He said I was wrong, and that in planning it didn’t matter who made a comment on a planning application, it was the substance of the comment which mattered. He said in this respect planning was different to licensing. Cllr Boyce also argued that publication online made the position very different to making the material available for inspection. He said only residents of Cambridge would go and view material in the council whereas now it was being made available to anyone. He noted that as the council was publishing the material “any programmer” could easily obtain a copy of all the documents released. Change of use of property from 6 bed house of multiple occupancy (Use Class C3) to residential (Class C3) and/or 5 bed student hostel with Warden’s room (sui generis) in the alternative. It appears a key document, the covering letter from the applicant is unavailable. The “applicant name” field has also not been completed. Many people have objected, so hopefully this will be determined by councillors. It might be worth writing directly to local councillors to ensure it is taken to a committee. I have repeatedly complained about the lack of public notices about planning applications; the council and councillors are happy to only do the minimum legally required. There are very many houses in the area of this application which are University of Cambridge accommodation – much of which is rented out as individual rooms, most cause no problems at all and I suspect local residents, even those like me who have lived within a few hundred metres of this site for many years would struggle to identify where they are. They are present on Harvey Goodwin Avenue, Searle Street, Alpha Road and Hertford Street. a particular institution I find it hard to see how the application could be refused. We can’t treat say Cambridge Colleges one way and other institutions another. I do think though the council could take a more active role in promoting good management of such properties – with a view to reducing things like excessive fire alarms. I don’t think the Cambridge Colleges are perfect by any means. I was very surprised when I came to Cambridge that the colleges didn’t appear to take students annoying neighbours seriously at all. When I was at Imperial college in London keeping the neighbours happy was taken very seriously, with technical and disciplinary measures being taken in response to complaints. The executive councillor responsible for planning, Cllr Blair, told the March 2011 North Area Committee that a report on the implementation of the new system would be published shortly. 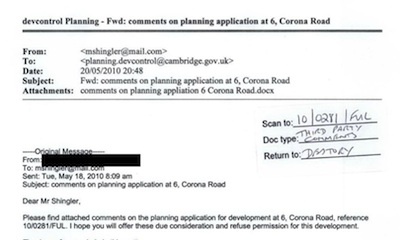 A PDF report on the planning public access system dated 24th March 2011; I presume this is the document referred to. While it may be a final report it leaves many matters either unresolved and/or unmentioned. I would suggest the North Area committee’s action list ought include clickable hyperlinks when a document is mentioned so it can more easily be found. During the open forum of Cambridge City Council’s East Area committee on the 14th of April 2011 the issue of the lack of consultation prior to the felling of trees at St Barnabas Church in Mill Road was raised. Liberal Democrat Cllr Sarah Brown defended the ruling group’s policy of not proactively drawing attention applications for such tree works even though it was clear from the views of the public present that had the proposals been widely known about they would have drawn objections. Cllr Brown argued that details of the tree works application had been available to anyone who had looked for them on the city council website. doesn’t really count as publishing something. Cllr Brown told those present that she published the upcoming tree / planning applications for her ward on her website and encouraged others to do the same; in response arguments were made that really what was needed was for the council to improve the data it was making available, so that residents associations, councillors and others including the council itsself could more easily make sure those likely to be interested in commenting on an application would be made aware of it. On Friday the 27th of May Cllr Brown tweeted to point to the latest list of planning and tree works applications which she had just posted on her blog. I replied to note that her way of working (manually copying and pasting the material onto her blog from the council’s website or email) was symptomatic of the flaws with the council’s planning public access system, which doesn’t offer live structured data, including geographic co-ordinates which would allow people to offer automatically updated maps, and alerts for applications and potentially ensure wider awareness of what was under consideration. 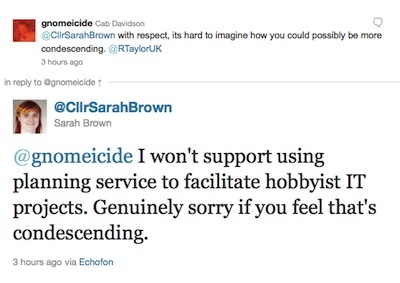 Cllr Brown dismissed my comments as being those of a “political geek”. 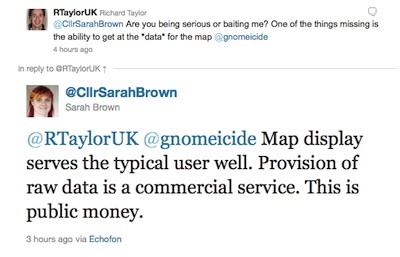 Cllr Brown then argued that “provision of raw data is a commercial service” and the graphical map view provided by the council was sufficient. 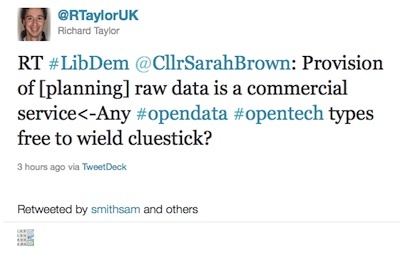 I then called, via Twitter, to ask if any #opendata #opentech types [were] free to wield cluestick”. 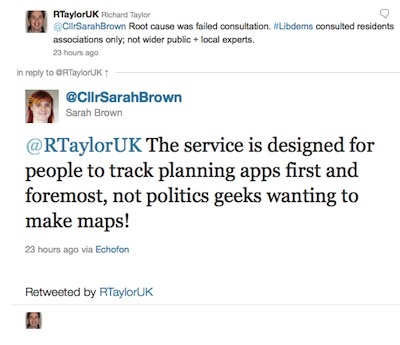 This prompted a few responses, including one from one of the UK’s top openness and transparency civil servants @DirDigEng who jumped in to ask Cllr Brown how much the council was making from selling its the data behind it’s planning maps, the locations of planning applications, to commercial entities. I had already expressed my shock and genuine disbelief that this happens (I really don’t think it does). 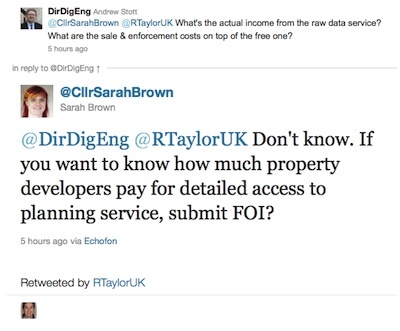 Cllr Brown evasively suggested @DirDigEng should make a FOI request if he wanted to find out. Cllr Brown still didn’t appear to grasp the problem, I and others tried to explain to Cllr Brown that if she released the location data then it would probably result in more people being able to find out about planning and tree works applications. The fact that these council IT systems still cannot produce a basic feed containing lat/long co-ordinates, application number, title and short summary is pretty shocking in this day and age. (a not-for-profit project operating for the public interest, incidentally) will have as a feature the ability to display, and then campaign on, planning applications (and other point-source locations) that will get added to the map automatically. We plan to use the Planning Alerts API (which I’m told has a temporary problem), but Councils really ought to publish simple feeds directly rather than make people have to resort to scraping and so on via Planning Alerts. All that is needed is the basic data as outlined above. I might accept that a much more detailed level of data might be ‘commercial’, but not this basic data that enables something as simple as plotting forthcoming planning applications on a map. Lastly, it is disappointing to see an intelligent councillor dismiss this as ‘hobbyist IT’ needs or the desires of ‘political geeks’. This is key information of direct relevance to democratic scrutiny of decision-making. Locking the data away fails to enable communities of interest to become more easily aware of planning applications in a simple way. Projects like the above rely on automated appearance of data, and the idea that someone should have to copy the points manually into a second database is just farcical. We're also keen to see improvements in the way planning applications data is made available online, e.g. fixing the many @Idoxgroup bugs.